Brita Kiffney is one of the lovely veterinarians at Northshore, and is responsible for managing their Facebook Page. We had the pleasure of sitting down with her one day and diving into their Facebook Page and strategy. When we first spoke to her, she was posting as little as one post or fewer per day. When she had the time to upload an original picture of one of her patients, she would do so. If she didn’t have time that day, she wouldn’t. But even with how little she posted to their Page, they still enjoyed solid engagement from their fans. This told us that Northshore’s Page had a ton of untapped potential waiting to be unlocked. After meeting with us, Brita decided to give ActionSprout, and a content curation strategy, a try. Here we’ll walk you through the steps that she took to get her ActionSprout account and new strategy off the ground. First, Brita had to follow the right pages through ActionSprout. Fine-tuning who she followed was the key to the rest of the strategy working. After all, these are the sources whose posts she should be sharing on Northshore’s own Facebook Page! Ensuring that they posted content that was on topic and tone, compared to their own Page, was really important. Once followed, Brita was even able to add custom tags to the Pages. She tagged the fun Pages as such, the fellow vets, and so on. Now if she was short on serious material one day, she could sort by those tags and only surface the content options that applied. How did the tool know when her fans and supporters were on Facebook? Facebook gives this data to all Facebook Page managers. When connecting your Facebook Page to ActionSprout, ActionSprout is able to look at this data and pull out the best times for you. With everything in place, Brita was able to pop in and out of the app as needed. On busy weeks, she could come in on Monday and schedule three to four posts for each day of the week. When she had the extra time, she would pop in once every day or so and schedule things as they came up. And, as always, when she had cute pictures of her patients, she published them. We were blown away by the results after just a few days! Through the use of ActionSprout and her new content curation efforts, Brita was able to increase her posting frequency to a consistent four to five posts a day! The ActionSprout app allowed Brita to schedule posts for the entire week so that, as she got busy, her posting stayed consistent. Consistent posting is key to consistent reach and engagement on Facebook. She also noticed a change in engagement on their Page. The number of likes, comments and shares on their posts noticeably increased. Content curation can feel uncomfortable for many nonprofits when starting out. It feels counterintuitive at best, and like stealing at worst. What we have to keep in mind is that Facebook is not a traditional communications channel. Facebook and social media in general are social spaces where ideas, content and stories are freely shared among users. Sharing is hardwired into Facebook; proper attribution is automatically included and the sharing of worthy content is expected. Most of all, the results speak for themselves! So, what are you waiting for? 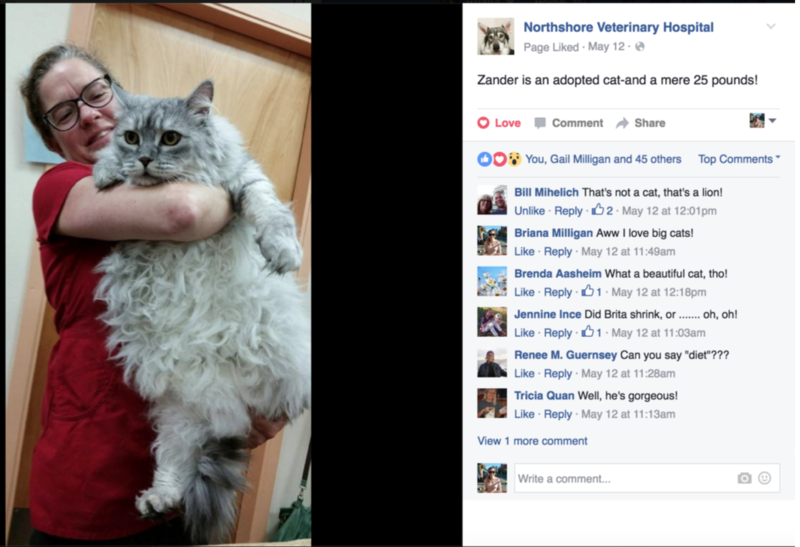 Start your own content curation strategy today and start seeing the same success as Brita at Northshore Veterinary Hospital.